Last week we shared this Eclectic Zen Living Room that we are working on, and we are so excited to also share the other outdoor space that is under construction in this same home. Whereas the other space was being used for relaxing outdoors, this one is more for entertaining. Although this space will be used for fun activities, it is off of the dining room and living room, so we wanted to keep it more formal in design. The shape of the fireplace is pretty interesting, but we didn’t understand why the seat was open underneath. Along with adding flagstone to the face of this structure, we are also hoping to remove the frame around the actual fireplace and that dead space underneath the hearth. These Moroccan lanterns will also be removed along with the windows which lead to nowhere on either side of the fireplace, but we plan to paint this wall some sort of accent color to reinforce the focal wall. We have shortened the doorsteps on each side to allow for more walking room and space to move around the pool table. This will also allow us to create a fun stone border around the new stone floor. This courtyard has an interesting place in the house as it is completely surrounded by interior rooms but left open above. Therefore creating an indoor outdoor feel is very important to us. When creating the inspiration for this space, we knew we wanted it to be slightly formal with a modern edge. The flagstone we selected has mitered edges which makes it look contemporary and the gray color makes a statement and keeps things current. 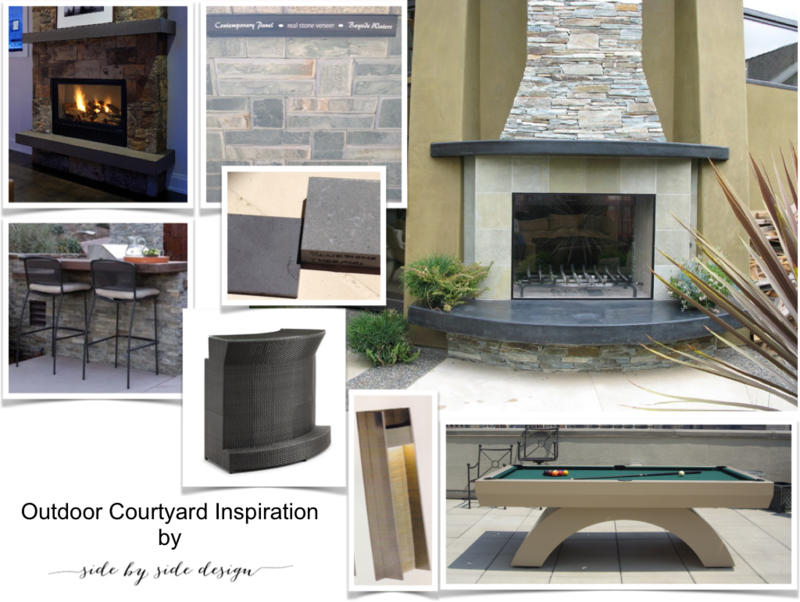 The dark gray stone will be a nice contrast for the hearth seat as well as the mantle (as seen in the inspiration photo on the right), and the even darker gray stone will be gorgeous on the floor. The rest of the space will consist of a modern pool table and some sort of bar area. Lighting will be a key element in framing the space and helping it to function. Although we still have some elements of this courtyard left to select, the construction has begun and is moving right along. We know that this unique space will have many interesting design elements and will serve as a fun place for this family to hang out with their friends. Both outdoor spaces are scheduled to be complete in another month. We can’t wait to see how they turn out and to share the finished photos. In our previous post, Before and After: Tuscan Elegance Powder Bathroom, we shared a project that we are so proud to be working on. Today, we continue to show our progress (slow but steady) on this special couple’s home. When designing a space, no area is insignificant, and when you have clients whose attention to detail is just as on point as your own, there is no easy task. Choosing the right wall color becomes a creative process, finding the right lighting fixture is super important, and you may even choose to add texture and depth where there once were flat surfaces. Every small detail should be completely thought out and executed flawlessly (even if it takes a few tries to get it right). This client’s entryway is not very large but has interesting features like the nooks on either side of the front door. The main focus when you walk in is actually the grand living room just beyond the entry space which is designed formally and over the top. We wanted to design this space to compliment the living room nicely while not competing with it in any way. We kept it rather simple but included some special design elements to make it formal and fit with the overall aesthetic as well. The first step in creating an authentic Tuscan look was to give the walls texture and a bit of color. When we first started working in this home, all of the walls, baseboards, window frames, and doors (with exception to the front door) were white. It was quite the task to transform this space as it has a domino effect with the remainder of the hallways and open areas surrounding them. We ended up continuing this finish into the kitchen as well for a cohesive look and throughout the entire hallway on the other end. This tiny niche contains the coat closet and was just big enough for this piece of art which the couple collected on their travels. These moldings were hand selected to finish off and bring some elegance to the main archways on either side of the front door. You won’t believe that they were actually refinished three times before we finally settled on this color. In the end, painting them to match the walls gave the moldings a more understated and authentic look. For the light fixture, we wanted to select something interesting but were restricted by the ceiling height. We found this ceiling mounted fixture which is a reproduction of an old Italian style and knew it was the perfect fit. The clients found this runner on their own … don’t they have great taste? The niche on the other side of the doorway houses the gorgeous powder bathroom we showed in our previous post. This piece of art was created by the owner’s father, and we decided to do something a little unusual by hanging it underneath the windowsill. This is the walkway leading into the kitchen area (which we are working on now and can’t wait to show to all of you). Although this entry is a small space, it was definitely an important one to get right. The design elements we used created the palette for all of the common areas in this home. It set the tone for the Tuscan elegance we are working to achieve and stays true to the client’s level of class and sophistication in design. Lauren has truly enjoyed working on this particular home. She loves what her clients bring to the table and enjoys fine tuning these ideas and bringing them to life. The clients are what makes each project unique and we love the challenge that each new space brings. For more information on our design services email us at sidebyside.design@yahoo.com or leave a comment below. We have a pretty exciting project to share with you guys today! One of our clients has hired us to create a comfortable outdoor living room along with a few other spaces (that we will be sharing at a later time). After lots of planning, the demolition has begun and we couldn’t be more excited to be one step closer to seeing this super cool space come to life. When we first heard of this project, it seemed pretty simple. Complete the outdoor existing space with a comfy sofa, large TV, fireplace, and everything you would need to enjoy a big game. As the project unfolded, many cool elements were incorporated into the design to assist in the function of the space as well as to create an eclectic zen environment. First things first, we decided to remove the center column in this open walkway. It was completely blocking the view (what a shame) and totally unnecessary. Therefore, it’ was the first thing to go. The original space had been added on to by the previous owners, but clearly was never completed. You can tell by the exposed pipes and awkward walls. In the end, this wall will be completely built out and will include a TV, fireplace, bench seat, and niches for candlelight. The remaining two archways will have consoles built into them to look more like windows, and the humongous fifteen foot sofa we selected will sit against them. To complete the space and give it a cozy “living room” feel, we are installing a wood floor ceiling which will house recessed lights, heaters, speakers, and some sort of lighting fixture or ceiling fan (still to be selected). 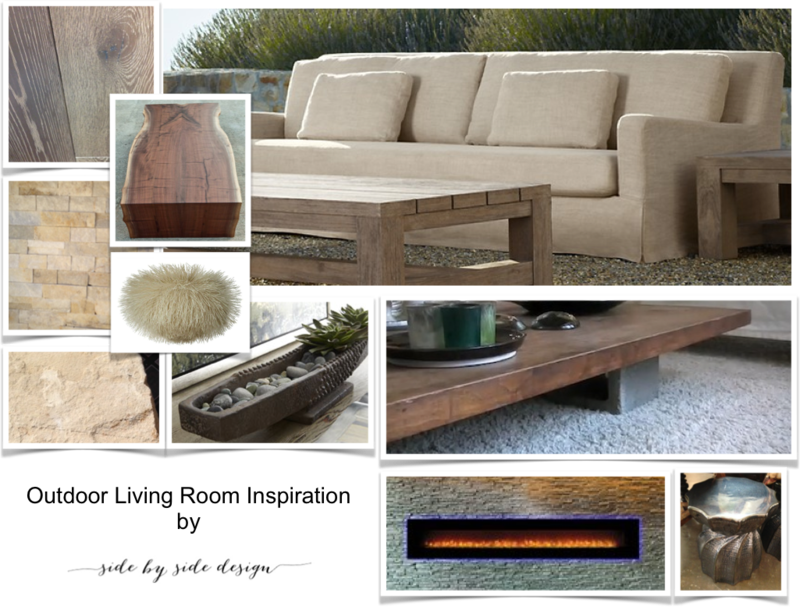 Lauren creates inspiration boards to give her clients an idea of the mood she would like to set for each space. This serene palette sets the tone for the cozy room they would like to have and incorporates some funky, eclectic elements (such as this woven rattan light fixture and metal drum side table) to give the space some personality. The wood panels, stone veneer, and natural stone slab gives it an earthy and slightly rustic feel while the modern fireplace keeps the overall design current. The furniture is designed mostly for comfort, but we have to admit that the gorgeous Sunbrella fabric we selected and some sort of live edge wood table are sure to be the main focal points. With the construction underway (as of yesterday) there is still a lot to do to complete this project, but we see the end in sight. We can’t wait to see how it all turns out and share it with all of you! When we were eleven years old, a special blessing was bestowed upon us. Our youngest sister was born and we once again became big sisters (as we each have a total of five siblings)! We remember the day Maya was born like it was yesterday. When her mom and our dad brought her home from the hospital, we were literally afraid to touch her. She looked so perfect, like a little doll. As she grew, we grew less and less afraid and began carting her around everywhere we went, teaching her all kinds of things that only big sisters can. We loved to dress her in all of her pretty clothes, we loved to read to her, we just plain loved her so much! At the age of four, Maya began to take dance classes. From the start she was a natural. Although we had tried our hand at ballet, it ultimately was not our passion. However, nobody could deny the way Maya lit up the stage when she danced. We can remember countless times driving Maya to her ballet studio. She would pop out of the car with a huge smile on her face. Although she went many times a week, it never seemed like a chore. She loved it! Our favorite memories, though, are of her dance shows. The word “recital” doesn’t even do it justice … they were full on shows with lights, and sound, and beautiful costumes. Each year we would watch as the Seniors took the stage and danced to their last song, but our eyes were always on Maya. We knew it wouldn’t be long before she was a Senior herself and would make us all proud. Maya kept it up. She danced from the time she was four all the way through High School, and a few years ago we watched with tears in our eyes as she took the stage one final time. Of course we knew this was not the end for Maya. She may have ended her childhood dance career, but there were still so many things for her to do in this world. A few years ago, Maya picked up and left for college (as seen on our previous post: College Girl). She continues to make us proud every day and is just as serious about her school work as she once was about dance (We are sure she has some fun though too!). Today is Maya’s 21st birthday! 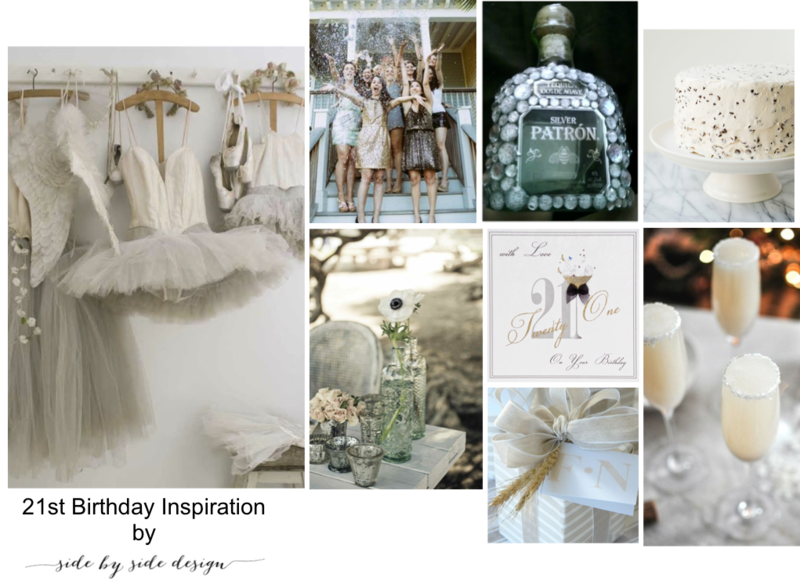 In honor of our amazing sister on this special day, we have put together this 21st birthday party inspiration board. It takes our memories of our little sis and puts them into a classy yet fun event that stays true to who she is; sweet, sassy, and sophisticated well beyond her years. When we first laid eyes on this picture on Pinterest, we knew we loved it for some reason … we guess it reminded us of the beautiful dancer and woman our sister is. It became the inspiration not only for this post, but for the entire event board we created. We love the color scheme and soft details and knew we could recreate those elements for this special event. As Maya is away at college, we are sure her friends are happy to celebrate her all day long! Keep it classy, girls (wink, wink)! To start, these dainty flowers and the gorgeous glassware would set the table beautifully for a nice birthday lunch. Classy cocktails set the tone for an evening out on the town. Followed by … more drinks! You only turn 21 once, therefore this blinged out bottle of Patron is definitely the way to go! Maya has a huge sweet tooth, especially for chocolate. This delicious cake is the perfect end to the night. Lots of love will be sent Maya’s way from her family and friends at home. We are all thinking about her today and wishing her the best birthday ever! … and of course, a few gifts are fun too! The bond between sisters is unbreakable and ours with our youngest sister, Maya, has grown stronger in each of her twenty-one years. We know that Maya will continue to make us proud in everything that she does and continue to be the most beautiful woman we know both inside and out. 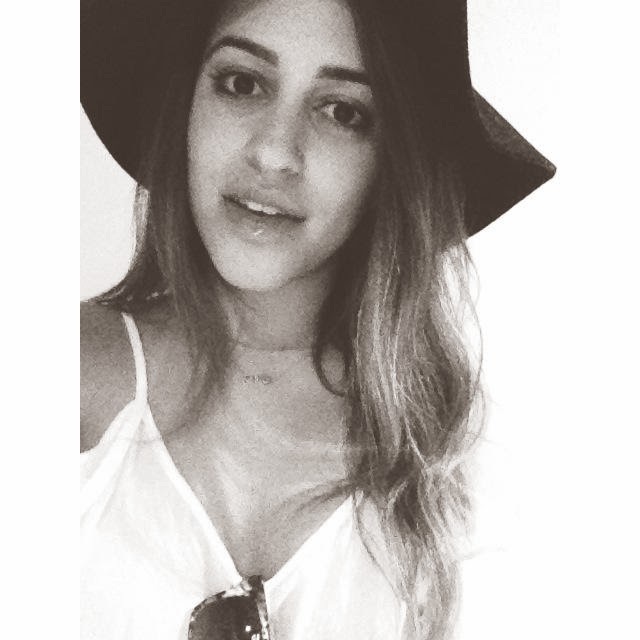 Happy 21st birthday Maya. To health, to happiness, to a lifetime of blessings. Cheers! Lauren’s favorite breakfast consists of Kefir, sliced banana, and vanilla almond granola. When feeding your baby try plain whole milk yogurt mixed with banana and some Puffs on the side. Yum! A little egg scramble starts a weekend off on the right foot. Lauren included asparagus, mushrooms, shrimp, and a little mozzarella in hers. The baby version eliminates the egg whites but includes plenty of shredded cheese and steamed asparagus cut into small bites. A yummy chopped salad with turkey, cheese, tomato, avocado and a light balsamic dressing (mixed with olive oil, salt, pepper, and lemon juice), can be served to your baby as well. This delicious dinner was waiting on the table when her hubby returned home from work (just kidding, Lauren’s not Super Woman). She made this Rachael Ray recipe, which turned out fabulous! It includes balsamic glazed chicken, sliced eggplant, diced tomatoes, mozzarella cheese, and some basil stacked just right. Ava enjoyed her steamed eggplant mixed with diced tomatoes as well. Whether it’s breakfast, brunch, lunch or dinner let your creativity go wild and come up with some new ways to introduce healthy foods to your family. What’s your favorite family meal? We’d love to hear from you. Post a comment below.